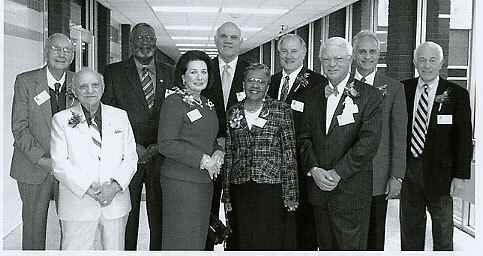 "Farrell Alumni Hall of Fame Honorees"
Contact: James A. Raykie Jr.
2009 Inductees of the Farrell Alumni Hall of Fame pose in the hallway at Farrell High School before the fifth annual dinner on October 17, 2009. From left are Thomas Nevant, Louis M. Nicastro, Ronald E. Clarke, Rosemary Sava (who accepted for her husband, posthumous honoree and former schools superintendent John G. Sava), Dr. Brian Generalovich, Dr. Martha I. Bruce, Dr. James G. Kollar, Jerry F. Sharell, Dr. Dean Matanin and Mark R. Magnotto. The purpose of the 'Farrell Alumni Hall of Fame', established by Ted Pedas in 2005, is to recognize former students who have brought distinction, honor and excellence to the Farrell Area School District through their accomplishments and achievements. The Hall of Fame provides an opportunity to showcase the diversity of Farrell's graduates from 1904 to the present, all of whom are listed on the Farrell (PA) High School Alumni Archives web site which was created and funded by Ted Pedas, FHS '56. The 5th Annual Farrell Alumni Hall of Fame Awards Banquet was held on October 17, 2009 in the cafeteria of the Farrell Area School District. James A. Raykie Jr., editor of The Herald and chairman of the Alumni Hall board of directors, served as the master of ceremonies. A note of appreciation to Jim Raykie for his efforts in launching the Farrell Alumni Hall of Fame and compiling the program which includes the below biographical information. Donations are welcome to help support the Farrell Alumni Hall of Fame and its related activities, culminating with the annual induction ceremony that showcases the success of Farrell High School graduates, its retired administrators and teachers. The induction ceremony is scheduled annually for the third Saturday in October. Louis M. Nicastro, who graduated from Farrell High School in 1940, spent more than 30 years in business eduction and has dedicated more than 65 years of his life singing and entertaining for free at various events and functions. During his years at FHS, he served as one of the school's last male cheerleaders. After his graduation from Farrell High, his plans to attend Westminster College were put on hold as he served for 35 months in the U.S. Army's 113th Calvary Group as a Tech-4 Sergeant. His Reconnaissance group was awarded five Bronze Stars for its engagements in Normandy and throughout France, Belgium, The Netherlands and Germany. The French Deputy Council awarded individual medals to all remaining members for liberating many French towns during the "Famous Run to Paris" under either General Omar Bradley or General George Patton. The total strength of the 113th was 300 troops, of whom 174 were either wounded or killed. After his military service, he earned a bachelor's in business administration from Westminster and a master's degree in education in 1950. His more than 30 years of teaching business education subjects included work-study programs at Youngstown's South High School and Chaney High School. In those cooperative office education programs, his students spent their mornings in office-simulated classrooms and their afternoons at their workstations in various Youngstown offices. He helped former Farrell High Business teacher and faculty adviser of athletics, the late Joe Duich, develop the school's first work-study program and was its guest speaker at its Appreciation Banquet at the end of the year. All of his singing, starting in 1936 with Farrell's Vincent Greco's Mandolin Orchestra to the annual "Senior Follies" sponsored by the Mercer County Area Agency on Aging, has been on a volunteer basis. He was encouraged to sing from meeting Frank Sinatra at the Nu-Elms Ballroom in Youngstown in 1941. Thomas Nevant, who graduated from Farrell High School in 1942, used his collegiate experience and his U.S. Navy endeavors to eventually return to his alma mater where he made his mark as a longtime teacher and administrator. After graduating from Farrell High in 1942, he enrolled at Westminster College in New Wilmington, Pa., but in mid-term, he was called to serve in the Navy. He was involved in the first wave at Utah Beach on June 6, 1944 at Normandy, for which he was decorated for his participation. The Jubilee of Liberty Medal was presented by former U.S. Rep. Phil English at the Mercer County Courthouse on Nov. 11, 1998 during the Jubilee of Liberty of Normandy celebration. After his honorable discharge, he resumed his studies at Westminster, graduating with a bachelor's degree in chemistry in 1949. After graduation, he attended Carnegie Tech Institute, finishing in 1950. In 1961, he studied in the educational program at Youngstown State University, and earned a master's degree from Westminster in chemistry in 1970. He began teaching chemistry at Farrell High in 1967 and was appointed assistant principal at Farrell Junior High School in 1974. He was appointed principal at Farrell in 1982, retiring in 1989. He was a partner of the Nevant Brothers Appliance and Hardware Store and has served the Farrell community in a variety of capacities, including membership in the former Farrell Boosters Club, Farrell Wolves Club, Farrell American Legion, and Farrell Veterans of Foreign Wars. Dr. Martha I. Bruce, a 1948 graduate of Farrell High School, was inspired by her grandmother to overcome polio that left her partially paralyzed, to believe that anything was attainable, and to give her the strength to explore her African heritage extensively abroad. The guidance and inspiration by her grandmother served both Dr. Bruce and her sister Shirley well in 1944, when they were stricken with polio which left both of them partially paralyzed. Driven to succeed, she returned to Farrell High School and graduated with honors. She earned a bachelor's degree from Youngstown College in 1951, regaining her place with her classmates who graduated from college that year. After teaching for 13 years in the Youngstown City Schools, she earned a master's degree in educational administration from Westminster College and a Ph.D. in communication skills from the University of Pittsburgh. She studied at the University of South Wales as well, where she earned a certificate for teaching English as a second language with represntatives from 26 countries. She dedicated her doctoral dissertation to her grandmother, who believed that there was nothing she couldn't accomplish. A brief visit to Nigeria in 1974 partially fulfilled her dream of visiting the land of her ancestors, but she wanted to see and learn more about Africa. She left her administrative post with the Youngstown schools to take an appointment with a college of education in eastern Nigeria, a post that she held as principal lecturer from 1975 to 1982. Her insight into African life and education as well as her volunteer work with local children led her to being invited to present professional papers at international conferences, and at several Nigerian universities, and others in Germany, Australia and England. For her volunteer work with children in Nigeria, she was nominated by people in the community and by the college staff for the United Nations Education, Scientific and cultural Organization literary prize. Upon her return to the States, she became an education specialist at the State Correctional Facility near Mercer from 1982 to 1986. Her unique approach to teaching reading to illiterate prison inmates earned her an invitation to the World Congress on Reading in Hong Kong in 1984. In addition to authoring numerous professional papers, she has published six children's books. She returnded to the Youngstown schools in 1988, and retired in 1996 as supervisor of media services and the Adopt-A-School Program. Since 1998, she has worked part-time as the liaison for Adopt-A-School, the school-business partnership program. Her passion is gardening and writing stories with the help of a special computer program that enables typing as she dictates. She is no longer able to play the piano or sew, but she finds time to help an autistic child learn to read. Dr. James G. Kollar, who graduated from Farrell High School in 1954, returned after a heralded athletic career at Marquette University in Wisconsin to become a respected member of the health-care community and a leader in civic activity and volunteerism, always keeping Farrell in the center of his efforts. After gruaduating from Farrell High, where he was a star baseball player and a key member of Coach Ed McCluskey's second PIAA state baskerball championship team, he attended Marquette University, where he continued his basketball career, serving as team captain in 1959. In addition to starring on the hardwood at Farrell, he accomplished the rare feat of lettering for four years in baseball, when the was one of two freshmen to play varsity baseball for coaches John Popadak and Bill Canterna. He graduated from Marquette in 1960 with a bachelor of science degree in education and from Marquette's School of Dentisry, earning a Doctor of Dental Surgery in 1965. Shortly afterward, he returned to his native Shenango Valley, where his professional services and his community involvement have been hallmarks for the last 45 years. For his contributions to his alma mater, he was awarded the Farrell Alumni Association's Blue and Gold Award in 2008, and for his athletic prowess at Farrell and Marquette, he was inducted into the Mercer County Sports Hall of Fame in 1990. For his dedication, he was awarded the Farrell Lions Club Service Award. In addition to serving on the Farrell Alumni Hall of Fame board of directors, he has been a member of the board of directors and past president of the Farrell Lions Club and a member of the Farrell Wolves Club and the former Farrell Booster Club. He was a member and past president of the former Farrell University Club and has been a member of the Farrell Italian Home, Mercer County Sports Hall of Fame board of directors, athletic board of Kennedy Catholic High School, the board of directors of the Farrell branch of First National Bank of Mercer County and Marquette's "M" club. Professionally, he is a member of the American and Pennsylvania dental associations, and the Wisconsin, Ohio and Pennsylvania dental associations. Jerry F. Sharell, who graduated from Farrell High School in 1957, has been a prominent executive in the recording industry for more than 40 years, a career that has enabled him to work with hundreds of famous musicians from throughout the world. After graduating from Farrell High, he attended Kent State University and graduated in 1961 with a bachelor of arts degree in radio, TV and speech. He supplemented his income while at Kent by singing in various clubs in Youngstown, Cleveland and Akron. He appeared on TV as "the kid from Farrell" on the Mike Douglas Show and the Bill Gordon Show a number of times - promoting the name of his hometown wherever he performed. After working at WPIC and WBVP in Beaver Falls, he moved to Cleveland in 1962 as a record promotion man for Mercury records. Through the years, he has held senior positions at Mail Line Records, A&M Records in Los Angeles, Buddah records in New York and Elektra-Asylum Recores in Hollywood. He was instrumental in bringing early success to dozens of recording artists who today remain his friends: Herb Alpert, The Carpenters, Sergio Mendes, Bill Withers, Curtis Mayfield, Sha Na Na, The Eagles, Queen, Carly Simon, Judy Collins, The Cars, Linda Ronstadt, Melissa Mandhester and Bob Crewe. Glenn Frey, one of the founding members of The Eagles, still calls Jerry "the guy from Farrell, Pa."
He spent five years at the advent of home video as as executive vice president of MCA Home Video and moved to radio giant, Westwood One, where he booked more than 300 concert shows for radio and TV broadcast for six years which put him in contact with every big name in the record business. Today, he is president and chief executive officer of the Society of Singers, a 25 year-old non-profit with a mission of providing emergency financial aid to professional singers in need and vocal scholarships to talented youngsters. In 2007, he began a radio show in Los Angeles on KGIL 1260 AM and in San Diego on 540 AM called "Jerry Sharell Plays Songs from the Great American Songbook" every Sunday from 7 to 10 p.m. where he entertains famous singers and other celebrities as his guests, and where he still talks about his hometown of Farrell. He and his wife, the former Joanne Messina, a 1957 Farrell High graduate as well, have three children all of whom live in Los Angeles. His mother, Helen Borawski, who is 95, still lives in Farrell. Mark R. Magnotto, who graduated from Farrell High School in 1958, used the experience from his alma mater to become one of the leading litigation lawyers in the country before retiring in 1998 after an illustrious career. He was class president at Farrell High in his sophomore and junior years, and after graduation, enrolled at John Carroll University in Cleveland, Ohio, and majored in political science. He was a member of the basketball team at John Carroll, as he was at FHS, and graduated with a bachelor of social science degree in 1962. In September 1962, he enrolled in the night program at Cleveland Marshall Law School. While attending CM, he worked for the Internal Revenue Service during the days. He graduated in June 1967 with a juris doctor degree and successfully completed the Ohio Bar Exam that summer. He returned to Farrell for family needs in 1968, and in May, he married his wife of 40-plus years, Pamela Gray. In March 1969, they moved to Lakewood, Ohio where he became a city prosecutor. In 1970, he left the prosecutor's office and entered private practice. In Novermber 1970, he was elected to Lakewood City Council and was reelected in 1974. He became council president in 1977, serving until 1978. In 1974, he became a litigation officer with the Insurance Company of North America at the regional office in Lakewood, and in 1976, was promoted to managing attorney in Ohio. After the merger of INA and Connecticut General Insurance to become CIGNA Corp., he was promoted to area vice president of litigation with responsibility of eight law offices in the Midwest, employing more than 70 lawyers and staff with responsibility for handling an average of 1,200 lawsuits. He retired from CIGNA in 1998 and moved to Sanibel, Fla. During his professional career, he was active in the Ohio and Federal bars as well as a number of civic and religious organizations. He was honored by INA as the outstanding managing attorney in the country in 1981 and by CIGNA as outstanding vice president in 1996. He and Pam have two daughters, Amy and Molly. Dr. Brian Generalovich, who graduated from Farrell High School in 1960, represents a classic example of the Farrell student who mixed tremendous athletic and academic skills to pave the way for an exceptional professional career in his chosen field of dentistry. He was one of the best all-around athletes produced at Farrell High. He was named first team all-state in football in his senior year and first-team all-state in basketball as he led Coach Ed McCluskey's Steelers to their fifth state championship in 1960. He was a major force as a junior in the drive by the Steelers to their fourth state title in 1959. He entered the University of Pittsburgh on a basketball scholarship, graduating in 1965, and from the University's School of Dental Medicine in 1968. He served in the U.S. Army's Dental Corps from 1968-1970 and opened a private practice in 1971. He had a fabled athletic career at Pitt, earning numerous honors in basketball. He lettered in football in his senior year as well. He remains one of the few collegians to be drafted by three organizations in two pro sports: the New York Knicks of the NBA, the Boston Patriots for the former AFL, and the Pittsburgh Steelers of the NFL. He opted for dental school instead. In private practice for nearly four decades, he is a member and has held board positions on numerous professional boards, and his service to this communtiy and to his college alma mater is extraordinary. He is past president of the former F.H. Buhl Club board of directors, a member of the Mercer County Sports Hall of Fame and served on the advisory board at First National Bank. He served on Pitt's Alumni Association Board for 11 years and was selected as a member emeritus of the association in 2002. He served as chairman of the building committee for Pitt's Alumni Hall, and was president of the Pitt Alumni Association for three years. In addition to serving Pitt in a host of capacities, he is a member of Pitt's board of trustees as well as the board of trustees for the Pittsburgh Symphony at the Scottish Rite. He was inducted into the Pennsylvania Sports Hall of Fame in 1986; the Mercer County Sports Hall of Fame in 1996; was selected as Letterman of Distinction at Pitt in 1993; was named Pitt's Volunteer of the Year in 2000; and was honored Legacy Laureate at Pitt in 2008. Ronald E. Clarke, who graduated from Farrell High School in 1961, used his experience from the United States Air Force to fulfill a heralded career with the U.S. Department of Defense. When he was a junior at Farrell High, Ron was an important piece of the 1960 state championship basketball team. After graduation, he attended Parsons College in Fairfield, Iowa, before enlsting in the Air Force. While in the Air Force, he was assigned to the Security Service Intelligence Command and served in the Philippine Islands, South Vietnam, and Japan. He was honorably discharged in 1967 and he returned to school at the University of Maryland, where he earned a bachelor of arts degree in business administration. He began his formal career with the Department of Defense at Fort Meade, Md., in 1969, serving in Operations Europe and traveling throughout the United States. As a senior operations officer, he served as a chidf of staff within the operations organization, responsible for the timely worldwide deployment of personnel and systems. In the later part of his career, he was assigned to the human resources organization where his broad operations experience was vital in the recruiting and hiring of many young men and women matriculating out of the military, colleges and universities. He was specifically instrumental in hiring linguists, electrical engineers, computer scientists and mathematicians into the various operational elements with the Department of Defense. In 1983, following in the footsteps of his father (Isaac F. Clarke) and his grandfather (Issac N. Clarke), Ron joined the Prince Hall Masonic family as a Master Mason (Rising Sun Lodge No. 46). Throughout the next 25 years, he held numerous influential Masonic posts and in October 2006, he was presented the Master Mason Lifetime Achievement Award, a significant honor within the Masonic organization. Dr. Dean Matanin, who graduated from Farrell High School in 1971, used the lessons he learned at Farrell in the classroom and on the basketball court and baseball field to lead him to becoming one of Western Pennsylvania's most well-respected doctors of pharmacy. After his graduation from Farrell High, he earned a bachelor of science degree in pharmacy in 1977 from the University of Pittsburgh and a doctor of pharmacy in 1981 from Duquesne University. Fifteen years later, as an adjunct to his highly successful career in medicine, he earned a master of healthcare administration from the University of Minnesota in 1996. As a youth, he dreamed of playing basketball for Coach Ed McCluskey. He played, sparingly, but he had a broader view and saw more than a game. "I learned so much by being a part of the basketball culture at Farrell High," he said as a part of his application. "...I learned hard work, and discipline, and preparation and perseverance. All of these factors contributed to my academic success at FHS and then at the University of Pittsburgh School of Pharmacy." Upon his graduation, he began his career as a staff pharmacist at Uniontown (Pa.) Hospital. To be closer to his future wife, he moved to the Pharmacy Department at Mercy Hospital in Pittsburgh. While at Mercy, he decided to work on the PharmD, and after one year of didactic curriculum, he was off to Rhode Island Hospital to complete his pharmacy residency. After earning his advanced degree and working at Hamot Medical Center in Erie and Allegheny General Hospital in Pittsburgh, the experience he gained served as a solid foundation as he became director of pharmacy at Latrobe Area Hospital, a position that he held for 20 years. He currently is system director of Excela Health, a four-hospital system composed of Westmoreland, Jeannette, Latrobe and the Frick hospitals, a position he has held since 2005. He has been a part of hundreds of lectures throughout his career on various healthcare related topics, and has been published numerous times in a variety of professional publications. He and his wife of 30 years, Sue, have three children. He said in his application narrative: "My successes and failures on the athletic fields and the hardwood prepared me for many of the challenges that I faced at the University of Pittsburgh...I can name a handful of teachers and coaches that played a very instrumental part in my successes: Paul Bohach, Tom Nevant, Mildred Grande, Sam Stanovich, Grassy Cannone, and of course, Eddie McCluskey...they played a vital role in shaping my character and abilities." The 2009 posthumous honoree is longtime Farrell High School educator and administrator and former superintendent of schools, John G. Sava. He graduated from Farrell High School in 1956 and earned a bachelor's degree in education in 1960 from Penn State University, where he was a member of the football team after starring for the Night Riders in high school. He later earned a master's degree in education from Edinboro University of Pennsylvania in 1964 and an administator's certificate from Westminster College in New Wilmington, Pa. He returned to his alma mater after graduating from Penn State and taught social studies from 1960-69, when he became an administrator. He was appointed superintendent in 1983 and held the post for 14 years, retiring in 1997. During his tenure, he initiated several programs including a model preschool; school-based family and health centers; and programs to reduce the rate of student dropouts. He described Farrell's programs before Congress, the National Governor's Association and the United Nations Summit on Education. He received an Excellence in Education Award from Pennsylvania Associations of Elementary and Secondary School Principals in 1995, and through his efforts, the school district was "A School of the 21st Century." He was selected in 1997 by his peers as one of the top six superintendents in the state. Through his life, he was very active in the Farrell comminity, He was a member of or on the boards of many professional and civic organizations. In nominating him his daughter, Rosemary, said: "I think that the success of a lifetime is measured by the perspective of others who were touched by your skills and persona. Did you work hared and lead by example? Did you encourage others to achieve their goals in a positive way? Did you offer your time freely and unconditionally? When your presence is remembered, does it fill your heart with happiness and respect? Did your actions earn you the admiration of peers, family, students and community? If those questions are how you measure lifetime achievement, then my father's was a huge success..."
He died on Sept 2, 2000 at his Farrell home at the age of 61. He married the former Rosemary Swaska in 1965 and they had two children: a daughter, Mrs. Adam (Rosemary) Feldman of Reading, Pa., and a son, James, of Athens, Ohio. Hall of Fame Awards and compiling the program which includes the above biographical information. One of my favorite community contributions is to serve as the master of ceremonies at the Farrell Alumni Hall of Fame dinner, which honors 10 graduates who have made their marks throughout the world. The fifth annual dinner was Saturday night at the Farrell High School cafeteria, and the Hall continued its tradition of honoring alumni from all walks of life - scientists, NASA engineers, retired majors and colonels, educators, chemists, doctors, dentists, lawyers, entertainers, and others. It's always a very special time. Lou Nicastro is 87 years young and was the last male cheerleader at Farrell in 1940. He taught for more than 30 years in Youngstown, and has been singing for more than 65 years. He stole the show Saturday, leading the crowd of more than 200 in a rousing rendition of the Farrell High Fight Song, after he brought them up to speed on the words. Tom Nevant, my chemistry teacher at Farrell, told of how special it was for him, living nearby as a youth with his parents, to watch every day the construction of Farrell High School (today's elementary school) brick-by-brick as a part of President Roosevelt's Works Progress Administration. Drs. James Kollar and Brian Generalovich, local dentists for many years, talked about their times at Farrell, lauding their teachers and coaches for reinforcing the foundations of their lives. Both Generalovich and Kollar starred for Coach Ed McCluskey's state basketball teams. Generalovich, six years younger than Kollar, paid special tribute to him, for serving as a role model and developing his interest in dentistry. Jerry Sharell was Jerry Stiftinger at Farrell High, but the entertainer and former senior executive for numerous record labels changed his name to contain parts of Sharon and Farrell. He has worked with most of the top musicians in his career, and the song of thanks that he performed at the close of his acceptance speech was heartfelt to say the least. Dr. Dean Matanin, the youngster of the group of inductees at 56, is a leading doctor of pharmacy in western Pennsylvania, and he too lauded Farrell High School, and Nevant in particular, in preparing him for the challenges of pharmacy school. Ron Clarke, who graduated in 1961, spent more than 30 years as a senior official with the Department of Defense, traveling through all parts of the world, always carrying the same piece of luggage that he received as a gift for being a member of the 1960 state championship basketball team. Mark Magnotto, who was one of the country's leading litigation attorneys for CIGNA, relived his days in Farrell, and as a part of a Friday night tour of the school to kick off the weekend, marveled at the condition and the facilities offered at the complex on Roemer Boulevard. Dr. Martha Bruce graduated in 1948 and was an absolute inspiration, overcoming polio as a child and fulfilling a lifetime goal of spending eight years in Africa, teaching at an educational college and spending countless hours with Nigerian children. The family of late Superintendent John G. Sava accepted his posthumous award. He served as a teacher, coach and administrator as well as superintendent. His grandchildren, Jessica and John, related their memories of their grandfather. It was an inspiring evening of gathering with alumni who have been successful and hearing the reasons behind their achievements, and how they were nurtured by family, friends, neighbors, teachers and coaches to succeed in a community and school that they fondly call Farrell. I realized early in life, before the right-brain and left-brain theory became popular in the 1960s, that the right portion of my brain dominates my personality. In basic terms, people governed by the right portion of their brain are creative and visualize the whole, and back into the parts. Left-brainers are analytical, gather all of the parts, and build them into the whole. Usually artists, musicians and writers are right-brainers, and mathematicians as well as biologists, chemists and other scientists are left-brainers. If I didn't realize before my days at Farrell High School that I was a right-brainer, I found out soon after my sophomore year. I struggled mightily in biology, chemistry and physics. Surprisingly, I excelled at general math and geometry, but I was terrible in algebra. My chemistry teacher and later a friend, Tom Nevant, unknowingly provided a defining moment for me one morning during his chemistry class. Tom, who died in late July a week before his 86th birthday, was a fine man and one of my favorite teachers, chemistry aside. We were working in the lab, and my cousin Joe Raykie and I were supposed to be creating a gas or something that didn't support combustion. The test of how well we did was to put a long, lighted match into a glass tube. The match, of course, was to go out, and Tom steadfastly stood by each of the pairs as they put the match to the test. To his utter shock, ours exploded, shattering the glass. Maybe that mess explains why I forged a career as a writer and Joe as a school administrator. But whether it was that day in class or throughout my association with him in later years as a teacher and principal at Farrell High, Tom was a congenial guy who brought a smile to the faces of people around him. He could be stern in his own way, but I'll remember him as a man who led a life filled with common sense and deep respect for others. I often thanked him for that day in class, and we laughed about it throughout the years. When I would see him, he would greet me with a smile and a robust "Stop the presses!" It was his unique way of saying hello, and I looked forward to hearing it. He was as kind to others as well. We inducted Tom into the Farrell Alumni Hall of Fame last fall, and as one might expect, his speech was short and to the point. Humility was one of his great qualities, whether it concerned his leadership at the school or his acceptance of the "Medal of the Jubilee of Liberty" with full colors for his meritorious service during World War II. When I stopped to visit with Frank Sincek at the high school one morning in the mid-1980s, Tom was praising a story that he had read in The Herald as I opened the door. After his usual greeting, he added as he ambled to his office, "Good writer, but lousy chemist." He retired as principal of Farrell High in 1989, ending a nearly 25-year association with his alma mater. Tom may no longer be with us, but I'll remember him in his trademark cap and his "Stop the Presses" greeting. I smiled when he said it, and I will when I think of him. My condolences to his wife, Serena, his four sons, and the rest of their family.